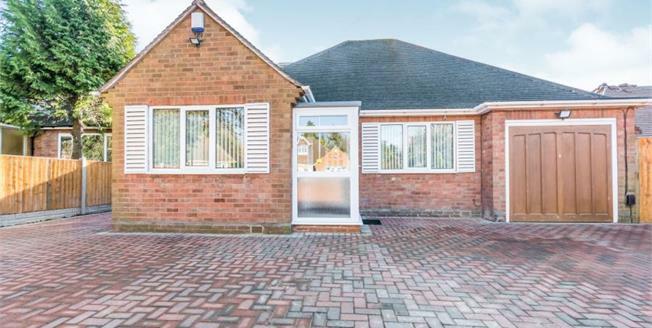 A delightful, beautifully presented, fully refurbished and extended four bedroom detached bungalow located on a quiet cul de sac in the heart of Olton conservation area. Internal inspection is highly advised to appreciate the high quality finish of spacious and versatile accommodation this property provides. In brief the ground floor offers; entrance porch, welcoming hallway, three double bedrooms with an en-suite shower room to the master, principle bathroom, study area, formal dining room, family lounge and a high specification fitted kitchen. To the first floor you will find an additional fourth bedroom and a shower room making an ideal space for guests. Double glazed UPVc porch with secure locking system, provides access into the Entrance Hallway. Obscure double glazed window to side elevation, central heated radiator, carpeted floor, ceiling light and door leading to en-suite shower room. Double glazed window to rear elevation, central heated radiator, carpeted floor and ceiling light. Double glazed window to front elevation, central heated radiator, carpeted floor and ceiling light. Obscured double glazed window to side elevation, central heated stainless steel towel radiator, vinyl flooring, spotlights, extactor fan, tiled walls, modern fitted bathroom suite comprising; paneled bath with electric shower over, pedestal basin and W.C. Obscure double glazed window to side elevation, central heated stainless steel towel radiator, vinyl flooring, spotlights, extractor fan, tiled walls and modern fitted shower room suite comprising; corner shower enclosure with electric shower, pedestal basin and W.C.
Central heated radiator, wooden floor, ceiling light and wall lights, electric fire place with marble effect surround and opening for double doorway into the open plan breakfast kitchen. Double glazed window to rear elevation, central heated radiator, wooden floor, spotlights. Fully fitted modern kitchen with a range of wall, base and drawer units, marble effect roll top work surface, stainless steel double sink with drainer, five ring integrated gas hob and integrated double electric oven, integrated fridge/freezer, dishwasher and washer/dryer. Double glazed UPVc patio doors opening onto the rear garden. patio doors lead onto a block paved patio area wiht majority of the garden laid to lawn with fenced boundaries. Double glazed dorma window to rear elevation, central heated radiator, carpeted floor, ceiling light and two eaves storage cupboards. Obscured double glazed dorma window to side elevation, central heated white towel radiator, vinyl floor, tiled walls, spotlights, extractor fan and modern fitted shower room suite comprising; corner shower enclosure with electric shower, pedestal basin and W.C.